Some hard freezes earlier in January put an end to much of the insect activity in my yard. The only conspicuous inhabitants of the last few weeks are a few Dainty Sulphurs that still fly on the warm days, an occasional house fly, a lady bug or two, and a few bees on the warmest of days (though few flowers exist in our yard at the moment). Regardless, I was in search of a Green Lacewing to complete a series based on the gravity-defying egg photo I posted a couple weeks ago. I thought it would be a piece of cake to find one - but apparently the cold weather has had an impact on them too. 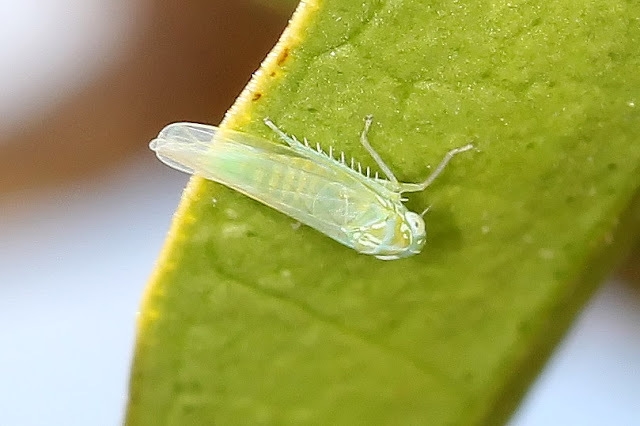 This is a Leafhopper, so named because of its ability to 'hop' from leaf to leaf. These bugs are often considered pests, especially to food crops. 'Sharpshooters' are part of a sub-family of leafhoppers, with the Glassy-winged Sharpshooter the most infamous (especially to lovers of wine and grapes). So many species exist that I may never know for sure what this one is, though it has been suggested it may be a Potato Leafhopper, Empoasca fabae. Great photo...interesting facts you've shared of the leafhopper. Wonderful macro! But I had to smile because insects - the bad ones - are one reason I like a cold winter, since the long cold seems to keep them in check. Excellent macro. I love the transparency of it's wings, great details. Wonderful details and green color. Your macro photography of insects is incredible!